Chris Hamilton tends to get stuck in a multitude of data and graphs. Bit of a shame. Sometimes it’s about what you leave out. But point taken: Demographics, Housing and Debt. I recently wrote an article explaining why a 30% to 50% decline in household net worth is imminent (HERE). No shocker that the primary asset for most in figuring household net worth is real estate, particularly primary residences. This article details why US housing starts and job creation are set to decelerate and a recession will almost surely follow… sending home prices tumbling (and likely equity and bond prices, to boot) severely negatively impacting US households net worth’s. First, the year over year change in housing starts (one unit variety) is highly indicative of the subsequent change (in 12 to 18 months) of full time employees (chart below…year over year change in full time employees blue shaded area) vs. YoY change in housing starts (red line)). As goes housing, so goes subsequent jobs creation. [..] If you think interest rate changes and housing creation look interdependent…you’re right (chart below). Again, total annual total population growth, 0-65yr/old population growth, housing starts (1-unit)…but this time including annual change in full time employees. I believe the interest rate hikes and decelerating deficits will slow housing and jobs creation…but even if I’m wrong, there is still trouble dead ahead as the US is simply running out of employable persons as the percentage of employed 15-64yr/olds is nearing all time highs (also known as potential homebuyers). Pensions problems are literally everywhere. But they come to light only when companies themselves collapse first. The looming pension crisis has been signalled in the collapse of Carillion. The deficit of latest private sector dead-on-arrival Carillion is officially £580 million. However, private reports suggest it could be as high as £2.6 BILLION. According to a Sky News investigation: ‘the £2.6 billion figure relates to the cost to Carillion of paying an insurance company to guarantee all of its pension liabilities, and is significant because it is likely to be the sum claimed on behalf of the pension schemes as part of the liquidation process.’ Nearly 30,000 UK workers’ pensions are at risk thanks to Carillion management’s total mismanagement of a company that has seen its share price collapse 94% in the last 12 months. Carillion’s 27,500-member pension scheme was placed on an ‘at risk list’ in autumn 2017. Arguably, it like many other pension funds should have been there many months ago. Sadly, Carillion is just the latest in a very long string of serious company collapses that have highlighted the major pension crisis in the UK and around the Western world. It also likely signals that we may be on the verge of many, many more very large corporate bankruptcies in the UK due to massive debt levels and unfunded liabilities. This is not a situation unique to the private sector. It will be repeated in the years ahead – both in the public and the private sector. In November 2017, the OECD warned that the UK’s defined benefit workplace pension plans (final salary schemes) as ‘persistently underfunded’ and the state pension as seriously lacking. Everyone is exposed by this and it emphasises the importance of saving for retirement and ensuring your pension is both funded and properly diversified. These ongoing disasters in the UK’s pension pots are also a threat to the efforts of prudent individuals who have worked hard to set aside enough for their hard-earned retirements. This will be copied across the world. South Korea has made moves to ban anonymous cryptocurrency accounts from being used for financial transactions. Financial authorities have already banned banks from offering virtual accounts that are needed to buy or sell cryptocurrency. New regulations set for next week will further the ban already in place by introducing a system to verify a person’s identity before they can make a transaction. Planned regulation also prevents foreigners and underage investors from opening cryptocurrency accounts in South Korea, Yonhap reported, citing financial officials. South Korea’s senior financial regulator Kim Yong-beom told reporters that six South Korean banks will begin issuing new trading accounts next week after the system is implemented. Those banks include Shinhan Bank, NH Bank and the Industrial Bank of Korea. Existing crypto bank accounts not linked to verified users will be banned on the same day, Kim said. Officials also announced on Sunday that cryptocurrency traders would be required to share user data with the banks, according to Yonhap. Newly proposed regulations would require banks to check whether cryptocurrency exchanges comply with the new transparency measures. The government will also be able to access users’ transaction data through compliant banks, according to officials, which may point to the government looking to enforce taxes on cryptocurrency transactions. Stricter trading regulations are part of a government system to curb speculative investment into virtual money, as many fear that the cryptocurrency bubble may soon burst. The government also hopes to prevent the use of cryptocurrency in illegal activity. The system aims to tackle money laundering and related crimes, along with speculation-driven overheating in the market, Kang Young-soo, head of the FSC’s cryptocurrency response team, said by phone on Tuesday after the announcement. “The government is concerned about manipulation of market conditions and injection of illegal funds while market funds are leaked into speculative investments,” he added. “We view that foreigners’ and minors’ investments contribute to our areas of concern.” All foreigners, including residents, nonresidents and “kyopo” ethnic Koreans with foreign citizenship, will be banned from trading cryptocurrencies in Korea, the FSC’s foreign media department said by email. Minors are banned after Prime Minister Lee Nak-yeon earlier claim the cryptocurrency craze could lead the youth toward crime. Trump can simply say NO. But he probably won’t. Following the news earlier this month that special counsel Mueller is seeking to question President Trump – and following today’s NYT report that Mueller had interviewed AG Jeff Sessions – moments ago the Washington Post reported that Mueller wants to question Trump over his decision to fire former FBI Director James Comey and the departure of former national security adviser Michael Flynn from the White House. According to two WaPo sources, Trump’s legal team could present conditions for Trump to interview with Mueller’s investigators as soon as next week. The Post also adds that Trump’s lawyers hope to have Trump answer some of Mueller’s questions in an in-person interview and some in writing. Within the past two weeks, the special counsel’s office has indicated to the White House that the two central subjects that investigators wish to discuss with the president are the departures of Flynn and Comey and the events surrounding their firings. Mueller has also reportedly expressed interest in Trump’s efforts to remove Jeff Sessions as attorney general or pressure him into quitting, “according to a person familiar with the probe who said the special counsel was seeking to determine whether there was a “pattern” of behavior by the president.” Earlier this month, Trump declined to say whether he would grant an interview to Mueller and his team, deflecting questions on the topic by saying there had been “no collusion” between his campaign and Russia during the 2016 presidential election. “We’ll see what happens,” Trump said when asked directly about meeting with the special counsel. While Trump has told has allegedly told his lawyers that he is not worried about a face to face meeting with the special counsel, some of Trump’s close advisers and friends fear a face-to-face interview with Mueller could put the president in legal jeopardy. A central worry, they say, is Trump’s lack of precision in his speech and his penchant for hyperbole. Roger Stone, a longtime informal adviser to Trump, said he should try to avoid an interview at all costs, saying agreeing to such a session would be a “suicide mission.” “I find it to be a death wish. Why would you walk into a perjury trap?” Stone said. “The president would be very poorly advised to give Mueller an interview”, Stone said. I googled Sessions. All articles on this are from WaPo, NYT, CNN etc. Where is the balance? The leaks from the special counsel’s office just keep coming. After reporting earlier today that AG Jeff Sessions sat for an interview with Mueller last week, the paper is now reporting that Mueller interviewed former FBI Director James Comey last year. The interview with Comey focused on the infamous memo he wrote where he alleged that Trump had asked him to take it easy on Michael Flynn. Many of the special counsel’s critics have warned that Mueller should recuse himself from all dealings with Comey, who is believed to be a key witness in the probe. Comey and Mueller have a long history of working together, and also share a personal friendship, having vacationed together. A spokeswoman for Sessions confirmed that he had appeared before the committee. Circling back to Sessions, the NYT pointed out that Sessions is perhaps one of the most important witnesses to be interviewed by Mueller. For Mr. Mueller, Mr. Sessions is a key witness to two of the major issues he is investigating: the campaign’s possible ties to the Russians and whether the president tried to obstruct the Russia investigation. Mr. Mueller can question Mr. Sessions about his role as the head of the campaign’s foreign policy team. Mr. Sessions was involved in developing Mr. Trump’s position toward Russia and met with Russian officials, including the ambassador. Along with Mr. Trump, Mr. Sessions led a March 2016 meeting at the Trump International Hotel in Washington, where one of the campaign’s foreign policy advisers, George Papadopoulos, pitched the idea of a personal meeting between Mr. Trump and Mr. Putin. Mr. Papadopoulos plead guilty in October to lying to federal authorities about the nature of his contacts with the Russians and agreed to cooperate with the special counsel’s office. The FBI is confident it won’t be investigated. There’s no-one to do it. During the financial crisis, the federal government bailed out banks it declared “too big to fail.” Fearing their bankruptcy might trigger economic Armageddon, the feds propped them up with taxpayer cash. Something similar is happening now at the FBI, with the Washington wagons circling the agency to protect it from charges of corruption. This time, the appropriate tag line is “too big to believe.” Yet each day brings credible reports suggesting there is a massive scandal involving the top ranks of America’s premier law enforcement agency. The reports, which feature talk among agents of a “secret society” and suddenly missing text messages, point to the existence both of a cabal dedicated to defeating Donald Trump in 2016 and of a plan to let Hillary Clinton skate free in the classified email probe. If either one is true -and I believe both probably are- it would mean FBI leaders betrayed the nation by abusing their powers in a bid to pick the president. More support for this view involves the FBI’s use of the Russian dossier on Trump that was paid for by the Clinton campaign and the Democratic National Committee. It is almost certain that the FBI used the dossier to get FISA court warrants to spy on Trump associates, meaning it used the opposition research of the party in power to convince a court to let it spy on the candidate of the other party – likely without telling the court of the dossier’s political link. Even worse, there is growing reason to believe someone in President Barack Obama’s administration turned over classified information about Trump to the Clinton campaign. As one former federal prosecutor put it, “It doesn’t get worse than that.” Joseph diGenova, believes Trump was correct when he claimed Obama aides wiretapped his phones at Trump Tower. Quite literally nobody seems to understand that governments are not households. Taxes do not fund government spending. That’s a core insight of Modern Monetary Theory (MMT) whose radical implications have not been understood very well by the left. Indeed, it’s not well understood at all, and most people who have heard or read it somewhere breeze right past it, and fall back to the taxes-for-spending paradigm that is the sticky common wisdom of the left and right. This, despite the fact that the truth of the proposition is obvious if you think through just a few steps about the process of money-creation. What makes it hard to see is the dense knot of conventional theory and discourse in which we are entangled, and which seems impossible to cut as cleanly as MMT suggests. But the discussion around the newly-enacted Republican tax bill has brought the issue of tax policy to the forefront again, and it’s time for the left to realize how fundamentally wrong that common wisdom is, and how continuing to argue within the phony terms of the taxes-for-revenue paradigm occludes and reproduces a persistent reactionary fiction regarding what taxes are for. The argument of the common-wisdom economic paradigm is that the government must collect taxes (or borrow money—we’ll get to that) to spend on whatever programs it wants to fund. In this paradigm, the government extracts money from an external, economically prior source, and uses it to pay for government programs. For both the left and the right in this paradigm, taxes are for funding government spending: money first flows into the government through taxes collected, and is then spent into economy in various programs and purchases. The arguments that ensue are over how much money to collect in taxes, from which sources, and which government programs to fund with the money collected. Most leftists take their stance within this paradigm. Bernie Sanders, for instance, says his Medicare-for-all plan would “raise revenue” from various taxes such as income and capital gains, and from limiting “deductions for the rich.” Dean Baker suggests a 4% increase in payroll taxes to “fully fund” Social Security and Medicare. These kinds of analyses, typical of the left, make points that are helpful in immediate political fights, and they’re also grounded in the conventional paradigm about, money, taxes, and government spending. That paradigm not only informs most thinking—whether conservative, liberal, or left-radical—about money in our society, it also informs the legal and institutional policy framework. It’s the paradigm of the household. We’re comfortable with the household paradigm because it reflects everyday reality. The household has to get money from somewhere to spend it. It’s obvious. But, also obvious, the household (or business or state) does not create money. That teensy little huge fact makes the household-government finance analogy wrong and wildly misleading. Unless we take that fact as of no significance—And how could we?—we need another paradigm. Analyses and critiques—no matter how radical—of government financing as if it worked like household financing are based on false premises, and false premises lead down meandering dead-end paths to wrong conclusions. We have to reject the household analogy whenever it comes up from any source, including our own minds, where it will sneak in. Most leftists, I’m afraid, do end up assuming it, and ignoring the huge little fact that it cannot be right. Governments rejecting Supreme Court decisions. Well, perhaps in Turkey that’s the rule. Ankara on Tuesday lodged a third request for the extradition of the eight Turkish servicemen who fled to Greece in July 2016 following a failed coup in the neighboring country, sources said. The request by Ankara was lodged just a few hours after Greek Justice Minister Stavros Kontonis received in Athens a delegation from the Turkish Justice Ministry where, according to sources, the Turkish officials underlined Turkey’s insistence on the return of the eight men who are accused of treason. The same sources indicate that Ankara has included new claims about the servicemen in its third request for their extradition. German weapons fight US allies. Since the 1980s Germany has sold Turkey some 751 Leopard tanks, including 354 modern Leopard 2 type, which has been previously used by Turkey an a cross border operation against Islamic State (IS, formerly ISIS/ISIL) terrorists and US-supported Kurdish militias in Syria. Throughout its military campaign in the neighboring country, Turkey lost a number of 60-ton Leopard 2 tanks, built by Bavaria’s Krauss-Maffei, due to mine explosions. Ankara has recently pressed Berlin and German arms companies to retrofit the hardware to offer better protection against enemy mines. The tanks used by Turkey come from decommissioned stocks of the Bundeswehr. The frontal armor on the hull and turret on the Leopard 2 is much thicker than on the sides and rear of the tracked vehicle. [..] The massive outcry from the German politicians was caused by the publication of pictures which allegedly showed German tanks used against the Kurds in Syria. An expert from the Bundeswehr confirmed to the German Press Agency in Berlin on Monday that pictures, distributed by the state-owned Anadolu Turkish news agency, showed Leopard 2 A4 tanks of German production. [..] “Angela Merkel must explain her Turkey policy,” said Jan Korte, an MP from the Left. He noted that German soldiers are directly involved in the war of aggression against the Kurds by flying Boeing E-3A Airborne Warning & Control System (AWACS) aircraft missions and not doing anything to stop the bloodshed on the ground. When seeing stats like this, one must fear for what is yet to come in Britain. Almost half of all children in some UK cities are estimated to be living in poverty, new figures reveal, amid warnings that welfare reforms are leading to an “emerging child poverty crisis”. An analysis of data indicates the most deprived areas in the country have experienced the biggest increases in child poverty over the past two years, with parts of London and Birmingham seeing levels rise by 10 percentage points to above half of all children. The “shocking” figures have been attributed to the benefit freeze – which has been in place since 2015 and leaves children’s benefits frozen until the end of the decade – as well as the high cost of credit for low income families, leaving many “spiralling into debt”. A report by the independent Joseph Rowntree Foundation (JRF) last month found that Britain’s record on tackling poverty had reached a turning point and was at risk of unravelling, with nearly 400,000 more children and 300,000 more pensioners living in poverty than five years ago. The JRF stated that while poverty levels fell in the years to 2011-12, changes to welfare policy – especially since the 2015 Budget – saw the numbers creep up again. Their report showed a total of 14 million people in the UK currently live in poverty – more than one in five of the population. Now the latest figures, collated by the End Child Poverty coalition through analysis of tax credit data and national trends in worklessness, estimate that child poverty in Manchester and Birmingham stands at 44% and 43% respectively. In the London borough of Tower Hamlets this reaches 53%. [..] A child is said to live in poverty if they are in a family living on less than 60 per cent of median household income. According to the latest official statistics, 60 per cent of median income, after housing costs, was around £248 per week. EU targets are for 2035. Ergo, they are not ‘strong’. They’re just as bad and weak as the UK 2042 targets. Don’t be fooled. The UK government is opposing strong new recycling targets across the EU despite its recent pledge to develop “ambitious new future targets and milestones”, confidential documents have revealed. A 25-year environment plan was launched earlier in January by the prime minister, Theresa May, who particularly focused on cutting plastic pollution. The plan, aimed partly at wooing younger voters, says “recycling plastics is critical”. A target to recycle 65% of urban waste by 2035 was agreed by the European council and parliament in December and now awaits a vote of approval by member states. But the UK’s opposition is revealed in a record of a subsequent briefing for EU ambassadors, obtained by Greenpeace’s Unearthed team and seen by the Guardian. “The UK cannot support a binding target of 65% for 2035,” said the record, compiled by officials from one member state and confirmed by others. Furthermore, the UK said its opposition meant it would not support the overall waste agreement. Fighting GMO resistance with more GMO. A road to nowhere but mass starvation. Monsanto is facing major threats to its historic dominance of seed and herbicide technology for the $40 billion U.S. soybean market. Rivals BASF and DowDuPont are preparing to push their own varieties of genetically modified soybeans. At stake is control over seed supply for the next generation of farmers producing the most valuable U.S. agricultural export. The market has opened up as Monsanto’s Roundup Ready line of seeds – engineered to tolerate the weed killer glyphosate – has lost effectiveness as weeds develop their own tolerance to the chemical. Compounding the firm’s troubles is a national scandal over crop damage linked to its new soybean and herbicide pairing – Roundup Ready 2 Xtend seeds, engineered to resist the chemical dicamba. The newly competitive sector has sown confusion across the U.S. farm belt, particularly among smaller firms that produce and sell seeds with technology licensed from the agrichemical giants. Many of these sellers told Reuters they are amassing a surplus of seeds with engineered traits from multiple developers – at substantial extra cost – because they can only guess which product farmers will buy. “Our job is to meet our customers’ needs, and we don’t know what those are going to be,” said Carl Peterson at Peterson Farms Seed. “I don’t think I’ve ever seen anything quite like this.” Monsanto has much to lose. Soybeans are the key ingredient in feed used to fatten the world’s cattle, pigs, chickens and fish. Net sales of Monsanto’s soybean seeds and traits totaled almost $2.7 billion in fiscal 2017, or about a fifth of its total net sales. Gross profits from soybean products climbed 35% over 2016, beating 15% growth of its bigger corn seed franchise. No, the solution is not more and new antibiotics. The solution is to stop using the present ones the way we do. It can be legislated by tomorrow morning. The number of new antibiotics being developed has fallen sharply since 2000 and drugmakers need to do much more to tackle the rise of superbugs, according to a report. Britain’s biggest pharmaceutical company, GlaxoSmithKline, and its US rival Johnson & Johnson are leading efforts to combat antibiotic resistance, according to the report, which was presented at the World Economic Forum in Davos. The Netherlands-based Access to Medicine Foundation assessed 30 of the world’s biggest drugmakers, including pharma companies, biotech firms and generic drugmakers, and produced the first independent report on the industry’s efforts to address drug-resistant infections. Overprescription of antibiotics, along with their overuse in animals, has caused growing drug resistance in humans with serious health implications – leading to the rise of superbugs such as MRSA that cannot be treated with existing antibiotics. England’s chief medical officer has repeatedly warned that antibiotic resistance could spell the “end of modern medicine”. Caesarean sections and cancer treatments would become very risky without the drugs used to fight infection. In Europe, an estimated 25,000 people a year die from antibiotic-resistant bacteria. In the US, at least 2m illnesses and 23,000 deaths a year can be attributed to antibiotic resistance, according to the foundation’s report. This topic contains 6 replies, has 7 voices, and was last updated by Nassim 1 year, 2 months ago. A pattern of behavior where an employer fires his employees? Not to be crass but wtf are they talking about? Does Mueller’s investigation travel through all time, space, and reality to all events past and present, all decisions he approves or denies? Is it treason or collusion to fire your employees? Or is it only treason when the President didn’t get authorization from the actual controllers before making his mascot/spokesman decisions? Oi. I don’t know what to do with counterpunch. Maybe this should be their mascot? Look, yes, governments tax ONLY TO MAKE YOU USE THEIR CRAPPY MONEY. It creates a false demand for their worthless garbage. That’s why the Federal Reserve coincided with the Income Tax. And yes, they can just print the money instead and not tax at all. BUT THAT’S NOT A MAGIC TREE OF ENDLESS WEALTH. Wealth comes from real people doing real things. The U.S. can print a million billion dollars. That may make you THINK they can buy a billion trillion 2x4s with it, but they can’t. There are still only so many forests, so many saw mills, and so many men. You can get exactly the same number of 2x4s after printing as before: the amount your economy is physically able to produce. What the money printing WILL do, however, is raise prices, via inflation, the expansion/dilution of the money supply. That generally means the economy comes unglued and you’ll get even LESS 2x4s than before. And while he’s suggesting that ‘leftists’ are off-base with austerity and should just pump the skittle-crapping unicorn to help the poor, in fact inflation and printing money HURT EXACTLY THE POOR THE MOST. It ain’t rocket science: that’s why they use it. That’s why they built it in 1913, and that’s why it goes on every day since: inflation is a tax on the poorest and a direct transfer of wealth from the outsiders to the insiders. At the rate they suggest, 2%, it will cause the poorest to lose HALF their money in 40 years, and the real inflation rate is far higher than that. Sound familiar yet, where the inflation tax — the most regressive tax ever known — doubles the number of people in poverty and compounding effect leads to a runaway wealth gap? Yes, that’s the skittles-crapping unicorn of “free money” counterpunch and every other economic illiterate promotes. And believe you me, the insiders are going to say “Yes sir! Right away sir! We’re going to give that poverty-inducing, wealth-transferring, money-printing solution to you good and hard, night and day!” We already have 5 people owning more than half the U.S. due to such policies, 100% of national wealth is in a stock market owned only by the 1% and higher, when are they going to wake up? You can’t print your way to prosperity. Real things take real work. There ain’t no free lunch, there ain’t no magic clown to give it to you. You, YOU create the wealth. According to Kavanagh you could land on a desert island, double the money supply, and Lo! A condo and an open-bar cabana would appear! Double it again and an inground pool and lounge chairs, maybe a hospital with a fully-stocked operating room and well-trained ER staff appears! See? Easy! Nobody had to pour concrete, drill and burn oil, manufacture parts. Nobody studied in medical school for 8 years, no one made bagels. No work at all. Just print money! If this is the state of the discussion, we are absolutely going to print more, with the absolute consequence of poverty and income disparity doubling again. And again. And again. Until we get it right. He-zeus. I can not print my way to prosperity. So why have taxes at all? All borrowing, all of the time. A lot is written about MMT but little about its assumptions. Its proponents advocate for the average Joe/Jane but take us to the same resource deprived world. Why have money at all, Ken? Why have exchange? Both are demonstrably the basis of a majority of societal dysfunction. Why continue with them? Because it’s all we know? That’s not a reason, that’s a rationalization (and I don’t intend to put that on you, except to the extent that you’re one of billions, including me, who are complicit–knowingly or not–in this cultural confusion). All else is deck chair management in this context. What a creep! What a vile human being! No murmer that the US presence has no UN mandate in Syria and in itself constitutes a war crime. No complaint that the US is trying to continue war in Syria by arming the Kurds. Also there are strong claims by Russian media that the US are training the remnants of ISIS in the south. Another thing he may ponder : Turkey has 3.5 million Syrian refugees. There are two options : Stabilise Syria and repatriate them or send them on to Europe. Which is better for Germany? After every such alarm – polar bears drowning, penguins starving, arctic ice disappearing, Antarctic ice shelf collapsing, Elk population dropping – with a delay of a year or two, scientific reports come out disproving the claims. However, the camel train has moved on and the media find some new catastrophe to parrot. An obvious manipulation of peoples’ perceptions. 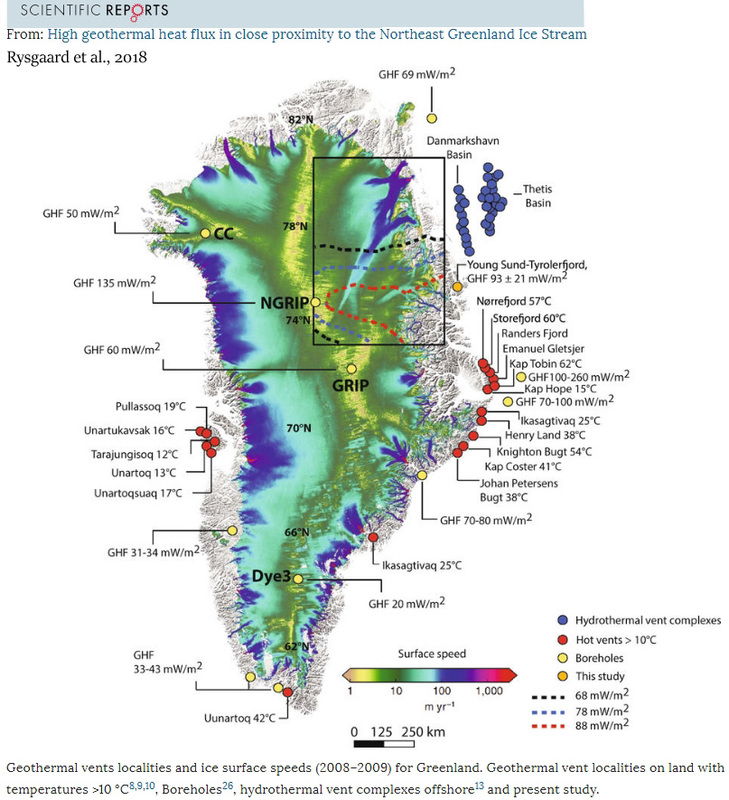 BTW, despite all the hot volcanoes under Greenland, the ice cover is doing fine this year. Not as splendid as last year, just average. It should be clear by now that whatever melting there may be in Greenland, it has nothing to do with the AGW hypothesis. The ice is melting from below full stop.